Is your skin feeling a little worn by the winter weather? If your heels, elbows, and hands are rough enough to cut someone then it’s time to lotion up! Instead of rushing to the nearest health and beauty aisle, how about making your own coconut oil lotion? This coconut oil lotion is perfect for achieving soft skin without subjecting your body to the chemicals and unnatural ingredients found in many store bought products. The beauty and health benefits of coconut oil are numerous and this is just another way to take advantage of this awesome ingredient. To top it off, this homemade recipe for beauty for coconut oil lotion is easy and cheap to make. Feel like kicking it up a notch? 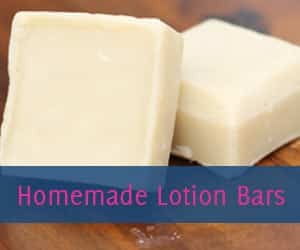 Pair this lotion bar with a homemade DIY Lip Gloss and you’ll be on your way to feeling good and looking great without breaking the bank. 1. 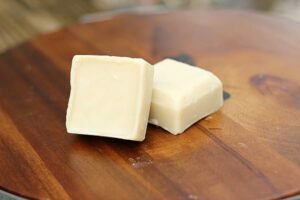 Melt coconut oil, almond oil and beeswax in a microwave safe bowl by heating in 30 second increments, stirring in-between, until the mixture is liquid and smooth. 2. Stir in the Shea butter until melted. 3. 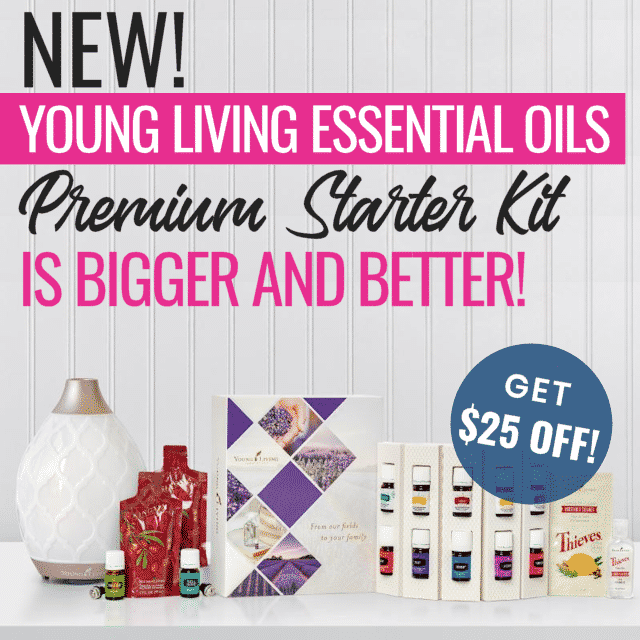 Add essential oils a little at a time. Start with 10 drops of each and then add more until desired scent is reached. 4. Pour hot liquid carefully into a silicone mold. 5. Allow lotion bars to sit overnight. 6. Remove from the mold and store in a cool, dry place. Remember that coconut becomes liquid in warm temperatures. After you try out these coconut oil lotion bars you won’t be able to get enough of coconut. Trust me. After you moisturize your skin, consider moisturizing your hair with this DIY coconut oil hair mask. 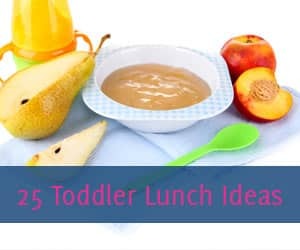 For more homemade recipes for beauty and beauty tips be sure to follow Freebie Finding Mom’s DIY Beauty Tips Pinterest board and read my other DIY beauty recipes. 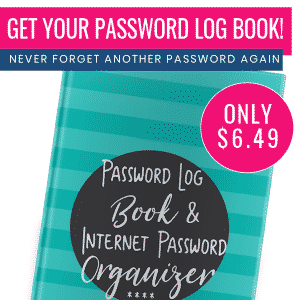 You can find it on Amazon.com http://www.amazon.com/s/?_encoding=UTF8&camp=1789&creative=390957&field-keywords=shea%20butter&linkCode=ur2&tag=monandsavhel-20&url=search-alias%3Daps&linkId=MP3OKOULU6S7JPEY. I bought some at Hobby Lobby. I would like to get more natural recipes for oily skin… And solution for pimples. Tried this recipe. There was way too much beeswax. They turned out so hard they did not deposit any oil on my skin. Are you sure about this measurement? Hi! Yep, that’s the correct amount that we used. It is hard but it melts on your skin. You can remelt it an add another 1/4 cup coconut oil, almond, and she then pour back into mold to reset. Love it!! Can i use other oil instead of almond oil?? Extra virgin olive oil for example. And I can substitute the basil oil for another one??. Thanks in advance. Yes you sure can! 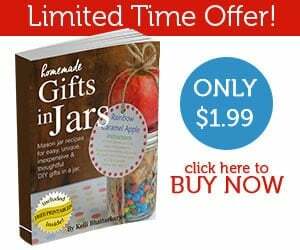 They beauty of diy beauty products is that you can customize to what you have on hand or your personal preferences. 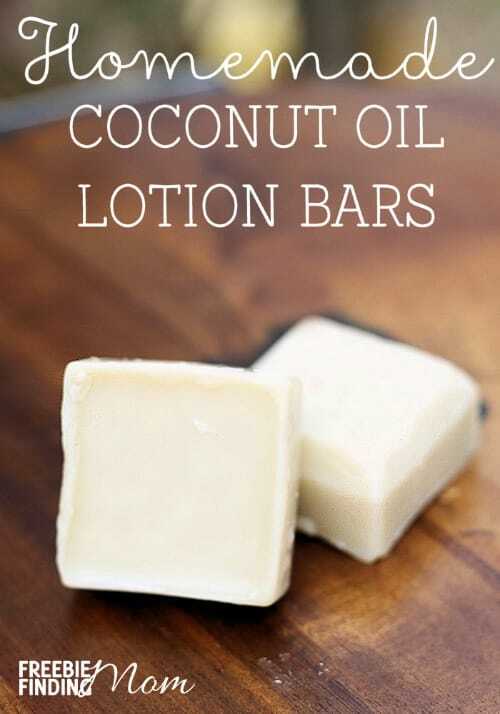 Hi, I just tried this recipe and the consistency is not working for lotion bars. Or there is way to much beeswax or too much shea butter but when you try to wash it off wont come out! How can I fix the mix I already made? Hi Vanessa, I think this is truly personal preference. I have very dry skin on my shoulders and upper arms and I use these regularly and enjoy the thickness of the lotion. This is meant for after shower not to be washed out and it will absorb into your skin as the day goes on, if you already have oily skin it may not be for you. 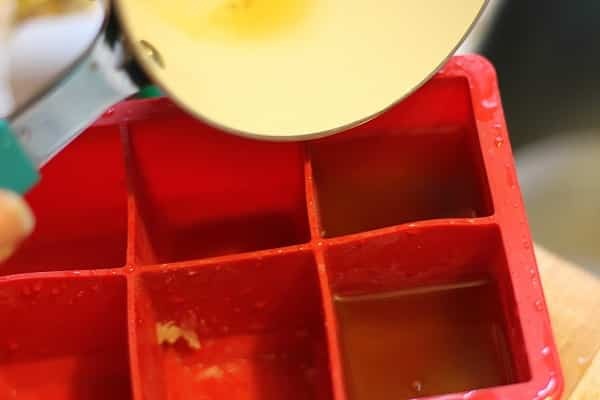 You can add a bit more oil to your mixture, remelt and pour into molds again. Hope this helps! Is there an alternative substitute for almond oil? I’m allergic to nuts and would love to try this out, but obviously I’m held back by the almond oil. I also have an allergy issue with the almond oil. Someone mentioned olive oil, but I am interested in other suggestions. Do you have to use silicone molds? Cause i have plastic ice trays and hate to go buy silicone molds if I can use the trays I have. Your ingredient lists include almond oil, but it is not mentioned in the directions. Was it supposed to be included before microwaving??? I guess I’ll find out how it works without because mine are already in the mold. Is there anything else I could use to substitute the beeswax? Another type of wax maybe such as soy wax? This is my second time trying to make this recipe and my beeswax won’t melt?!? Is there a trick to this or something I’m missing? coconut bar sounded interesting, but comments of it being hard and not coming off seems counter productive. Should wash off. Also approx. 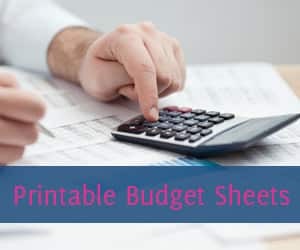 what is the cost of ingredients and how many bars of soap will you make using this recipe. Thanks. It’s a lotion bar, not soap. Do you normally wash off your lotion? Hi They came out great, what temperature do you store them? I found by microwaving the beeswax by itself first helps the process. Microwave for three 20 minute spurts in the microwave, checking it and rotating it each time. Then add the other ingredients. Hope that helps! I think you mean 20 SECOND spurts. I love this recipe! I would love to try it, though the video commercials were painful as I was trying to read it. On what temperature do you store them? My melt too fast on skin and I tried to put more beeswax but it didnt work. I made these this weekend and they turned out perfectly. I made a makeshift double boiler with my pyrex measuring cup and a pan of simmering water to get the bees wax to melt. I used my immersion blender too which helped break up the pellets even more. It takes some patience but it finally all melted. I added some of my soap coloring and added some soap glitter for about half of the batch. It makes a lot. I added a darker green halfway through too so I have 2 colors. I did coconut lime scent. I think they melt perfectly on my hands. Thanks for the recipe!